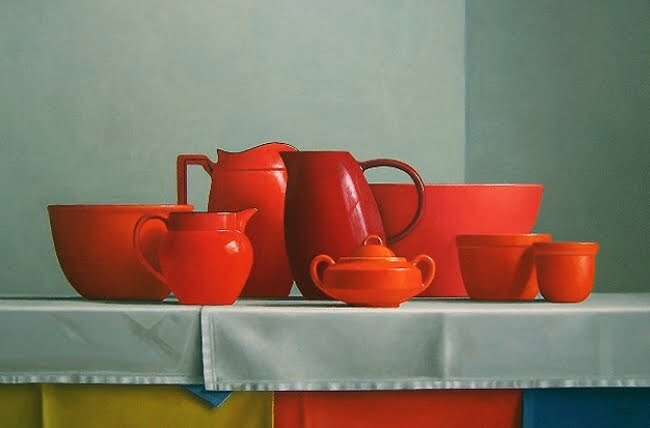 Janet Rickus was born in 1949 and raised in Chicopee, Massachusetts, but moved as a young girl to West Springfield, where her parents operated a grocery store. 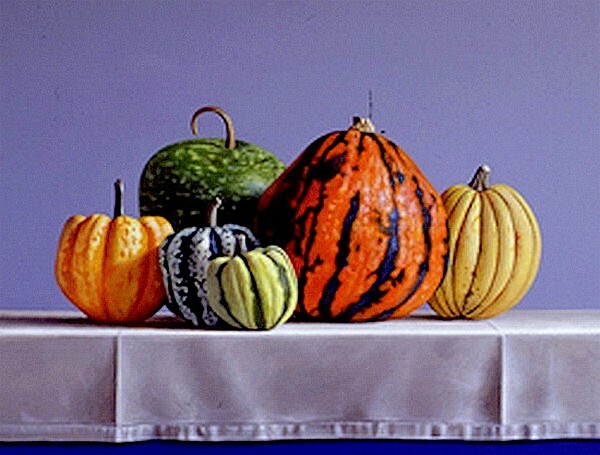 She states that being surrounded by produce as a child had nothing to do with her fascination with fruits and vegetables as subject matter for her still life artwork today. 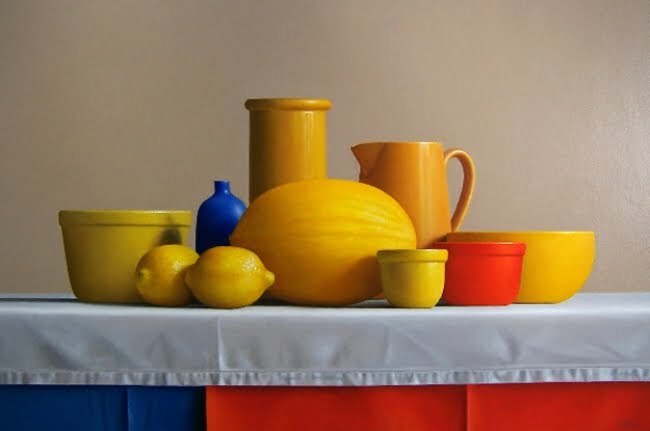 She started painting landscapes and portraits after graduating with a B. S. from Central Connecticut State University, and first began painting sill lifes in 1983. 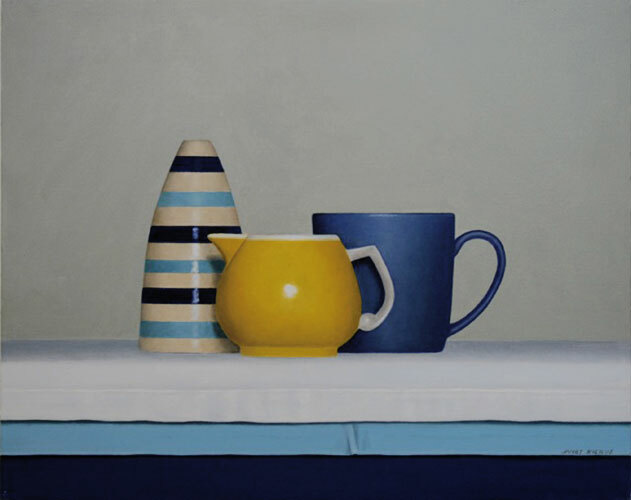 Rickus says that she is attracted by the shape and stability of her subjects. 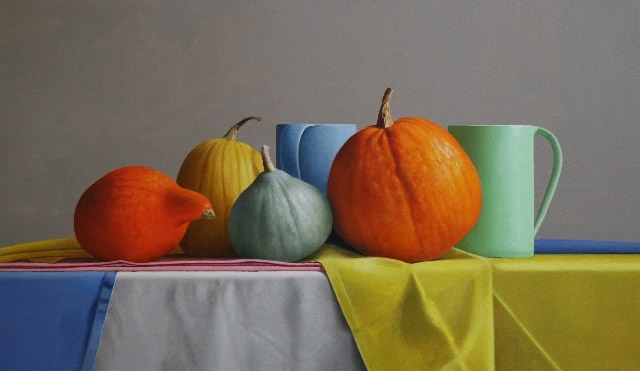 She takes great care in selecting and arranging her specimens, bursting with sumptuous color against simple backgrounds, poised upon crisp linens or soft tablecloths, bathed in natural light. 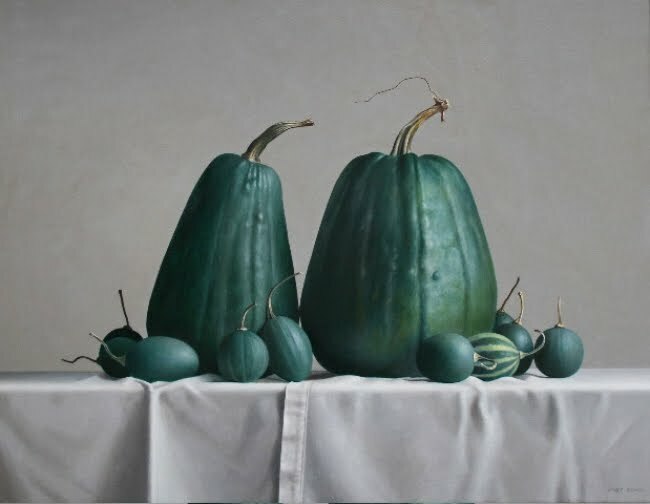 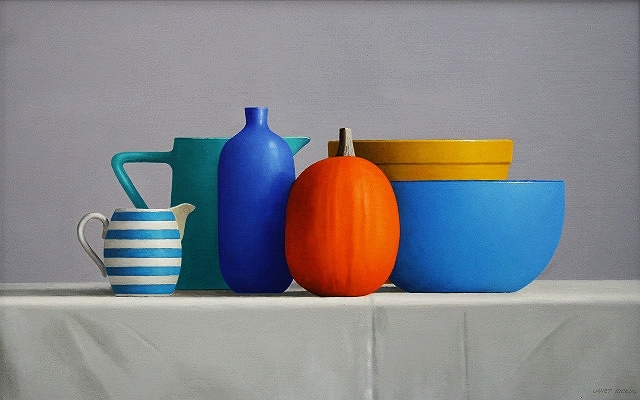 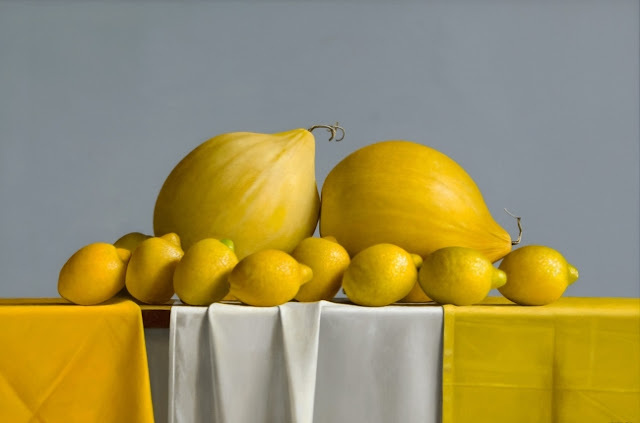 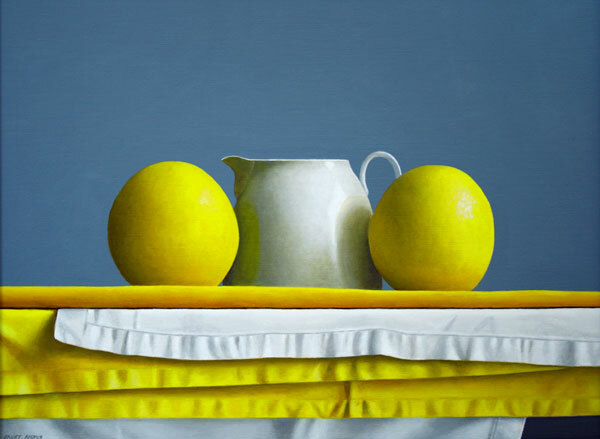 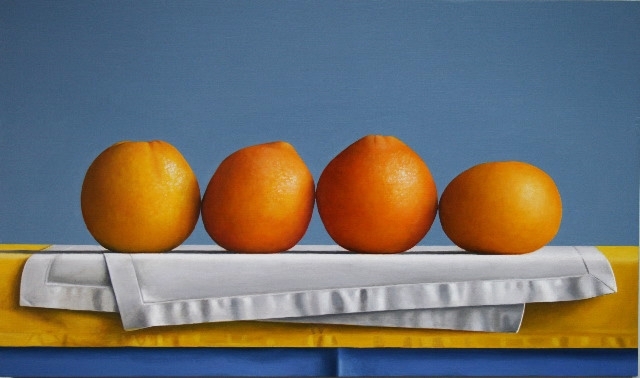 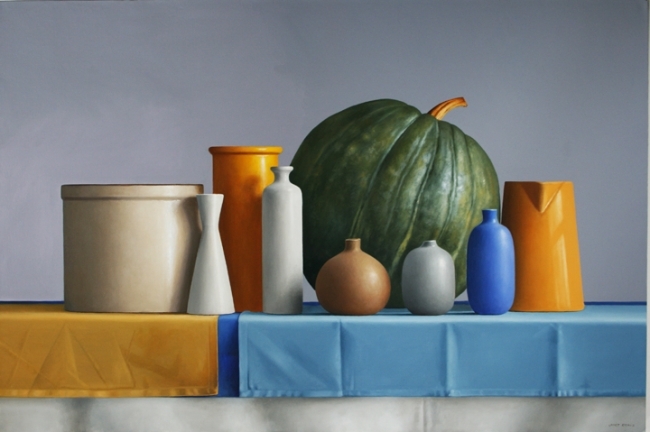 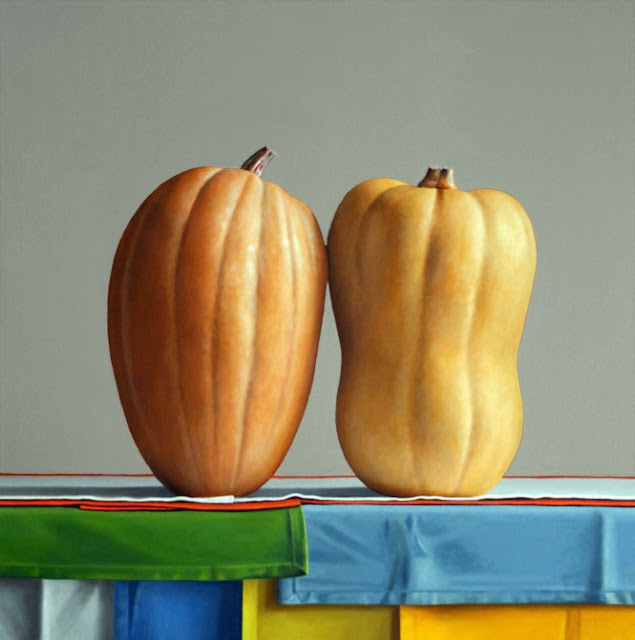 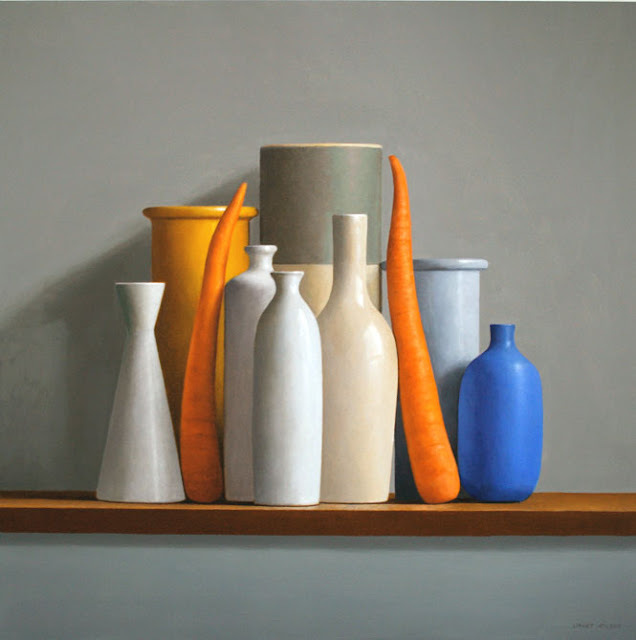 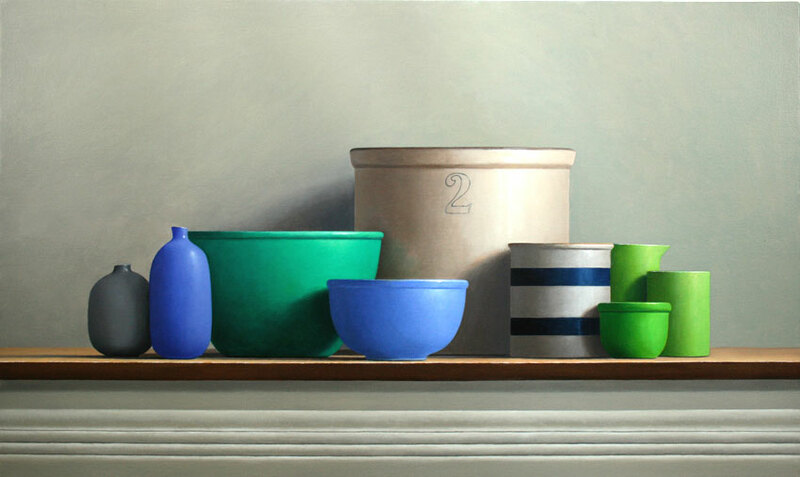 Her compositions are vibrant and luscious yet elegantly simple, and are meticulously detailed, demonstrating expert technique comparable to the Dutch and French still life masters. 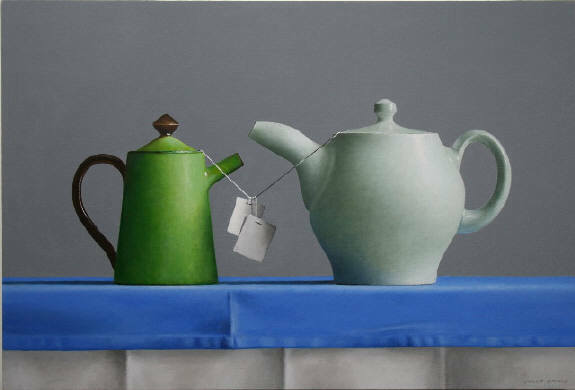 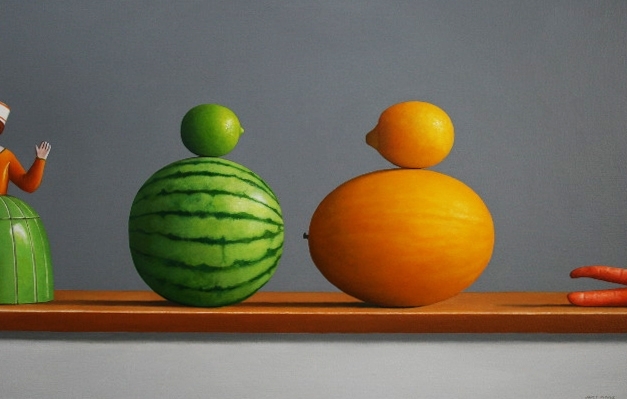 There can be an undeniable identification between the viewer and Rickus’s inanimate though lively subjects. Their shapes and colors are subtly indicative of personality, character, mood, and even gender, and their arrangements and interactions suggest relationships and narratives. 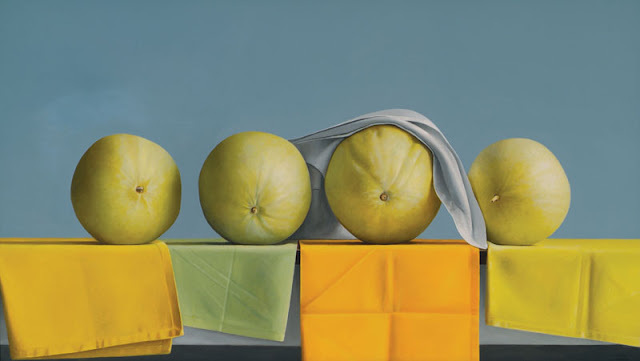 Her “Three Pears” was selected to illustrate the cover of Harvard professor Marjorie Garber’s book, Vice Versa: Bisexuality and the Eroticism of Everyday Life, and subsequently Rickus’s work was presented by Garber at a colloquium, femininmasculin, at the Centre Pompidou in Paris. 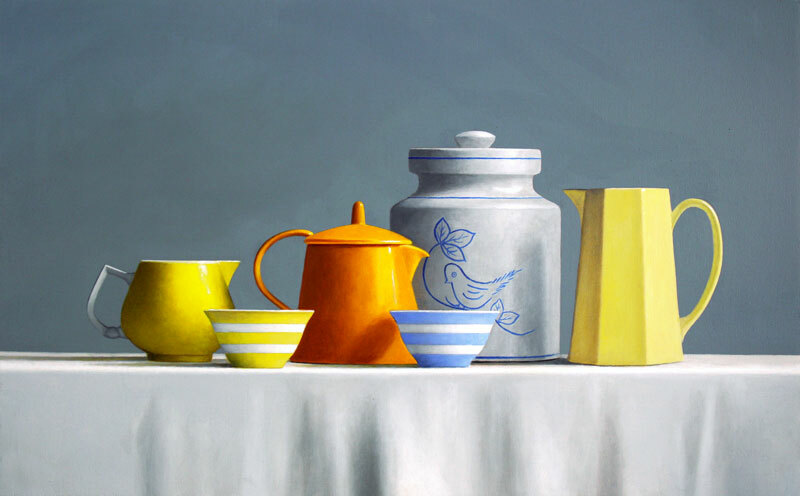 In 2006, Ms. Rickus was one of 39 state artists awarded a grant from the Massachusetts Cultural Council, which recognizes excellence in the arts and supports further development of their talents. Her paintings are held in major public and private collections internationally. 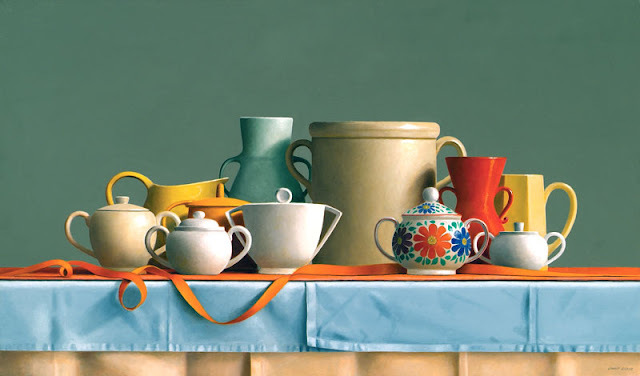 In 2001 she held her first museum exhibit at the Springfield Museum of Fine Arts. 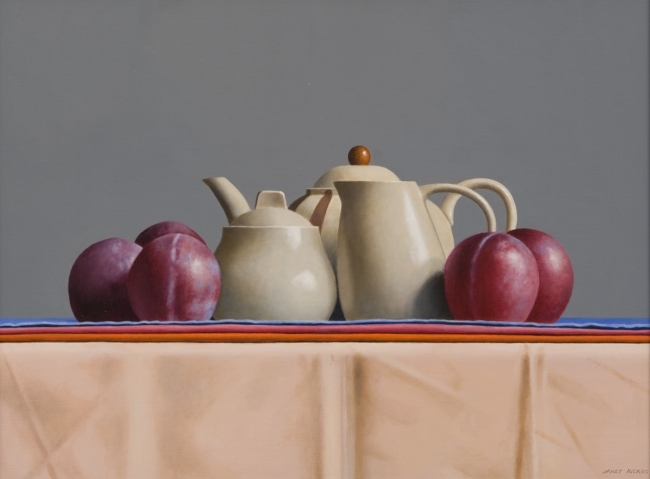 She is represented by the Hoorn-Ashby Gallery in New York, as well as at galleries in Pennsylvania, Florida and New England. She will be featured in an upcoming one-person show at Hoorn-Ashby in March of 2007. 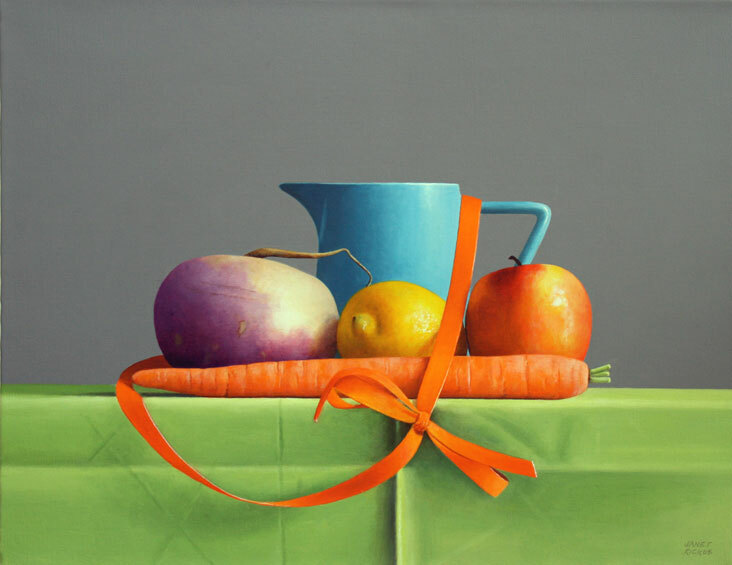 Etiquetas: Janet Rickus, painting, still life, U.S.